I read this article and found it very interesting, thought it might be something for you. The article is called Wisdom Tooth Removal and is located at https://www.dencaresmilecenter.com/oral-surgery/wisdom-tooth-removal/. Wisdom teeth are the last of your teeth to erupt through your gums. They are the third set of molars in a normal human jaw, and usually appear somewhere between the ages of seventeen and twenty-five. For some people, their wisdom teeth erupt just the same as their other teeth and they experience no problems whatsoever. However, for many other people, wisdom teeth can become impacted during eruption, which often necessitates wisdom tooth extraction. This occurs when a person’s jaw simply does not have enough room to accommodate these final four teeth. This can cause the wisdom teeth to become strapped below the surface of your gums or grow in at an odd angle. As a result, dentists will often recommend preventative wisdom tooth removal for patients that they suspect may experience these issues. Wisdom tooth removal itself is a relatively minor oral surgery procedure. In most cases, it will be performed in our office; only the most complex cases require referral to a specialist surgeon. Usually, the dentist will provide you with a series of instructions to follow prior to your oral surgery, which can involve avoiding eating food or drinking fluids, and also may require adjustments to either prescription or OTC medications that you may be taking. While the procedure is performed on an outpatient basis, the patient may be heavily sedated and unable to safely drive themselves home following the wisdom tooth extraction, so they should make arrangements for transportation to and from the appointment. When performing the wisdom tooth extraction, the dentist may choose to employ one of several different types of anesthesia. They can use local anesthesia which only affects the impacted area, mild sedation anesthesia administered through an IV which will completely suppress your awareness during the procedure, or general anesthesia inhaled through your nose which also will render the patient unconscious. 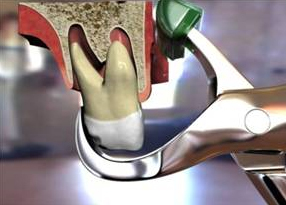 The procedure itself consists of the dentist making an incision in your gum, removing any bone blocking easy access to the tooth, possibly dividing the tooth into sections if necessary, then removing the tooth and carefully cleaning the affected site before stitching it closed to prevent infection. After a patient has had a wisdom tooth removal performed, their dentist will educate them on how to properly care for the wound while it heals, which can take up to two weeks. Mild discomfort may occur and can be treated with prescription or OTC pain or anti-inflammatory medication. As with any form of oral surgery, if you experience extreme pain, swelling, bleeding, fever or other issues, let your dentist know right away. For more information about wisdom tooth extraction and what treatment options may be best for you, contact Den-Care Smile Center at 1-847-DENTIST.